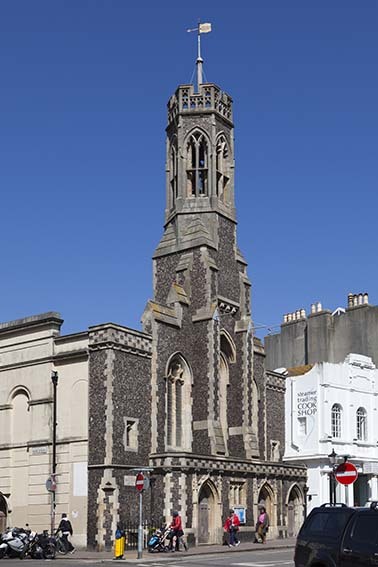 Holy Trinity was built as a chapel for his own sect in 1817 by Thomas Read Kemp, planner of Kemp Town. The architect was A H Wilds (Colvin 4th ed p1120), who did much work for him. In 1828, after Kemp returned to the Established Church, it was sold and became a chapelry within the parish of St Nicholas, the parish church (Sawyer I p217). When Frederick Robinson, the great evangelical preacher, was minister from 1847 to 1853, the fame of the chapel rivalled any other in the town. Wilds’s west front had heavy round windows, a pediment and a turret, but only the stuccoed south side, with blank round-headed arcading, remains. Originally it was concealed behind buildings along Duke Street, which was then narrower. The interior is recognisably an early C19 preaching house, with panelled galleries on fluted columns on three sides. There were alterations about 1826 to fit it for Anglican worship, including a new belfry, and these have been attributed to Sir C Barry (Dale p50 and, citing Dale, Colvin 4th ed p100). The list of works in the biography by Barry’s son does not include it so the attribution must be considered doubtful; though Barry did a considerable amount of work in Brighton in the 1820s, it is more likely that A H Wilds was re-employed, with or without his partner, C A Busby, who also did work for Kemp elsewhere. The main change at this time was a dome in the ceiling, but the galleries remained, with the communion table at the ‘west’ (actually eastern) end. In 1869 a chancel was added at the ‘east’ (actually west) end in memory of Robertson on a plot acquired when land to the south was given up for street widening (B 27 p871). It has a classical arch, a boarded roof and panelled walls. It was probably designed by the contractors, who were G Lynn and Sons, of Brighton (WSRO Ep/II/27/96). Alterations, planned in 1880 by Somers Clarke junior (Sawyer I p243) and carried out in stages, started with the interior in 1882, when the nave received a clerestory with cusped lights and a new roof with curved beams and turned posts. The front followed in 1885 and Somers Clarke confirmed his authorship in 1918 (AR 44 p109). It is flint and gothic and clearly intended to be followed by the rest of the outside. 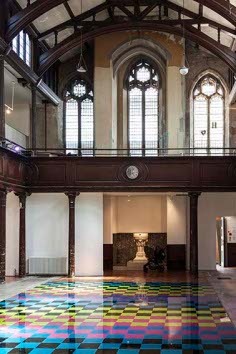 As it is, Goodhart-Rendel neatly described the chapel as ‘in a state of arrested transformation’ (ibid p25). The main part of the gothic front is in three parts with an open stone lantern on buttresses either side of the centre window. Beneath is a low porch, also in three parts with an additional arch to the north.. Unusually for Brighton, Holy Trinity never became parochial. It survived under trustees, who derived their income from letting their hall (Dale p55). By 1984, however, this arrangement could not be sustained and the chapel was closed. It stood empty and deteriorating for many years, but has since been re-opened as an exhibition space and hall. The seating has been removed, but most other fittings remain. 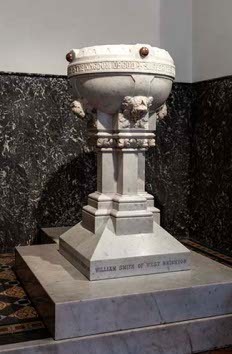 Font: Round white marble bowl of 1887, situated at the ‘west’ end in a recess formed from the supports of the lantern. 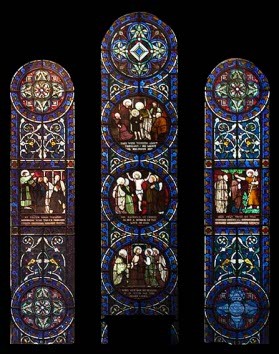 Glass: (‘East’ window and three in the ‘South’ chancel) J Powell and Sons, 1869, designed by H Holiday (B 27 ibid). They are in memory of Frederick Robertson and consist of medallions set in patterned glass, a device favoured by both designer and manufacturer, though no longer as popular by this date. Reredos: Maw’s tiles, 1869 (ibid).